The Rainbow Ring board has been upgraded to version 3! This is probably the most beautiful LED ring ever. 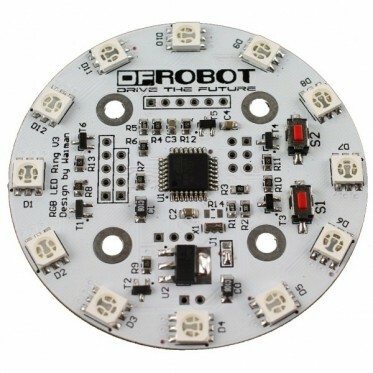 Each led on the ring can be controlled seperatly on its brightness and colors (RGB). It comes with pre-burned bootloader which has several built in led scripts. It allows I2C/Serial communication from any MCU and can be serially linked to make a beautiful Art piece via I2C. It can be programmed using standard Arduino IDE byFTDI breakout board. If you happen to have an idea or work done using this ring, please share your project with us in thecommunity.